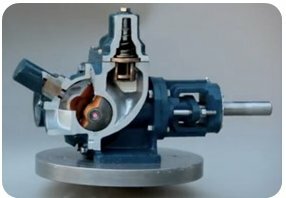 Used in applications around the world, Granco ball pumps are completely unique from any other positive displacement technology and offer a good alternative to gear or vane pumps. Edwin Grandberg founded Granco in 1938 after nearly a decade of perfecting his innovative rotary ball pump technology. Today, the company manufactures its pumps at its California facility using Grandberg’s original technology. The ball pump features a rotor with four large pumping chambers suspended in a spherical housing. The chambers open and close with every revolution, directing fluid to the heart of the rotor and then out into the line of flow with very little shear and high volumetric efficiency. Granco ball pumps have several benefits over traditional pumping technology and can be used successfully in a multitude of applications. They are ideal for applications that traditionally call for gear pumps, vane pumps, progressive cavity pumps, lobe pumps, or screw pumps. The pumps are easy to install and maintain because of their one moving part. No metal-to-metal contact ensures durable, long-lasting pumps with high volumetric efficiency and low energy use. Granco pumps can also have a lower total cost compared to competing technologies because of their lower maintenance and long operating life. “Our technology could easily fulfill many applications,” says Alessandro. For example, Granco ball pumps are frequently used in paint striping trucks. Because of the way the ball pump is designed, it is very well-suited to address the mobility concerns of paint striping trucks while effectively transferring the grit-laden paint. The Granco ball pump is used around the world by many well-known companies, including Chevron, Del Monte Foods, and US Army. The largest cattle farm in South Africa, Karan Beef, harvests 1,600 head of cattle every day and uses Granco H13 ball pumps to transfer molasses for its animal feed. Durable and efficient, Granco pumps meet the challenging requirements of pumping large quantities of viscous molasses for this customer.